Many animal groups in the wild exhibit … social behaviors and displays of communication, much of which can be passed from individual to individual by mimickry and association. But … there is something mechanical about innate calls as well as behaviours learned by rote. In our own experiences of learning we have a sense for the difference between what we have learned by rote and what we say we ‘understand’. [In] indexical association, [t]he word (iconically associated with past occurrences of similar utterances) and the object (iconically associated with past occurrences of similar utterances) and the object (iconically associated with similar objects from past experiences) and their past correlations enable the word to bring the object to mind … Animals can be trained to produce the same sign when presented with different kinds of foods, or trees, or familiar animals, or any other class of objects that share physical attributes … [For instance], the vervet monkeys’ eagle alarm calls might become generalized to other aerial predators if they were introduced into the environment. There are two things that are critically different [about symbolic representation]. First, for an indexical relationship to hold, there must be a correlation in time and place of the word and its object. If the correlation breaks down (for example, the rat no longer gets food by pushing a lever when the sound ‘food’ is played), then the association will eventually be forgotten (‘extinguished’) … For the Boy Who Cried Wolf, in the fable of the same name, the indexical function of the word ‘wolf’ fails because of its lack of association with real wolves, even though the symbolic reference remains. Second, even if an animal subject is trained to associate a number of words with different words … , each of these states will have little effect on the others. They are essentially independent … But this is not the case with words. In fact, they are incorporated into quite specific individual relationships with all the other words in the language … We do not lose the indexical associations of words … [Rather we have a] sort of dual reference, to objects and other words … captured in the classic distinction between sense and reference. Words point to objects (reference) and words point to other words (sense) … This referential relationship between words—words systematically indicating other words—forms a system of higher-order relationships … Symbolic reference derives from the combinatorial possibilities … and we therefore depend on combinations both to discovering it (during learning) and to make use of it (during communication). [W]e can immediately see the significance for learning … [W]hat determines the pairing between as symbol (like a word) and some object or event is not their probability of co-occurrence, but rather some complex function of the relationship that the symbol has with other symbols. 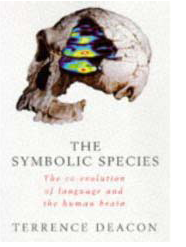 [T]he human brain [is an] evolutionary miracle. And what makes [it] extraordinary is not just that a flesh and blood computer is capable of producing a phenomenon as remarkable as a human mind, but that the changes in this organ responsible for this miracle were a direct consequence of the use of words … [T]he major structural and functional innovations that make human brains capable of unprecedented mental feats evolved in response to the use of something as abstract and virtual as the use of words … [T]he first use of symbolic reference by some distant ancestors changed how natural selection processes have affected hominid brain evolution ever since. [There is] one unprecedented cognitive computational demand associated with language that is ubiquitously associated with all symbolic activities. An unusual sort of contortion of [other animals’ rote, indexical] learning processes is required simply to overcome the mnemonic and attentional threshold that tends to prevent sets of rote indexical associations from becoming recoded into symbolic systems of association … [T]he particular neural computations required to surmount this mnemonic-attentional threshold are in the prefrontal cortex … To some extent, selection for this cognitive function is implicit in the fact that the prefrontal cortex is present in all mammal brains, and is particularly well developed in primates … [S]ymbolic reference itself must have been the prime mover for the prefrontalization of the brain in hominid evolution. Language has given rise to a brain which is strongly biased to employ the one mode of associative learning that is most critical to it.